EuroSafety ground schools utilize computer generated projected presentations. With high end graphics and animations these presentations accelerate the learning process and make the classroom experience an enjoyable event. Our instructors facilitate an open and interactive atmosphere that navigate the airframe system discussion in a manner that addresses the clients mission profile. Each course covers airframe systems, emergency procedures, publications and accident reviews. Throughout the courses there is an emphasis placed on airframe updates and potential areas that require vigilance. EuroSafety instruction manuals are designed to give the pilot in-depth knowledge of the airframe systems. The manual is the result of years of research and experience in the Eurocopter products and it provides an accurate and easy to read description of the aircraft systems and components. The color graphics, pictures and diagrams offer the reader an easy to comprehend correlation between the textual information and images. Many Eurocopter models are equipped with a Vehicle Engine Multifunction Display or also known as the VEMD. This parameter display LCD unit provides a method of displaying engine and airframe information to the pilot. It has a proven track record and since the unit is very similar in various Eurocopter models it provides for transference when transitioning between the airframes. As with any tool, its usefulness is predicated on our ability to operate it. If we are unable to understand the information that is presented to us by the display, that information is worthless. If we are unable to find information within a display, we are not receiving all the information that is available. If the device is not operating properly, or has a failure within it, the distraction can cause an unsafe situation within the cockpit. EuroSafety ground and flight training provide for a complete knowledge on the use and potential failures associated with the VEMD. This includes screen displays, configure page, maintenance pages, power check pages and screen failures. "Constant repetition yields subconscious reactions." EuroSafety's iSafety App is ESI’s latest effort in their goal to improve airframe knowledge and safety in the helicopter community. The iSafety App is designed to provide a method to review caution panel emergency procedures from various aircraft. 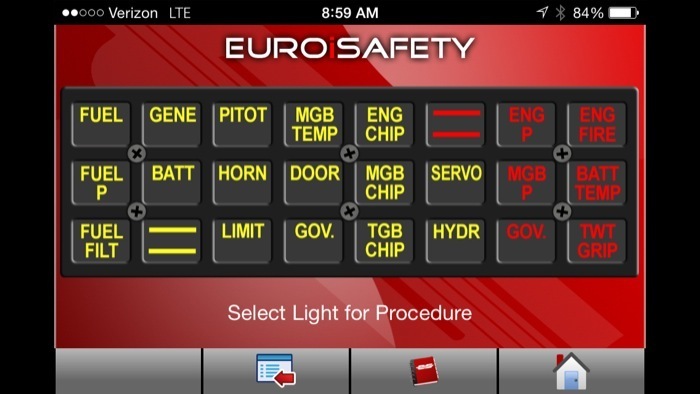 The current version of the app contains the caution panel procedures for the AS350B2, AS350B3 2B, AS350B3 2B1 Dual Hydraulic, AS355F2, AS355N, EC120 and the EC130B4. In upcoming updates more models will be added.